We left Vancouver just past midnight Friday night (Saturday morning) and we arrived at the airport in Taipei at 5:30 in the morning on Sunday. The kids slept well on the flight so we were pretty quick to our hotel and the looking for something to do. Helen's friend Katie picked us up and we were off to Yehliu Geopark. Being Sunday, she had her kids and attractions were busy - you could almost forget that we had been on an airplane for 12 hours. We were just happy to be outside to get some sunlight and try to fight off the jet lag monster! The geopark was really interesting! The softer rock under a hard rock layer erodes quickly and formed a lot of interesting shapes. Most of these shapes have names and some of them are "Famous". For some reason in Asia, they seem to like naming rocks and then making a tour package out of it. What really surprised me was the high quality fossils coming out of the stones. Coming from Vancouver, the tropical sun was really hot so we didn't last long. Katie took us back to the car and we headed off for lunch at a beach front restaurant. At this time of the year, Vancouver could best be described as "cold, dark and damp". We drove down the coast (past the nuclear reactors) for about a half an hour until we came to a beach front restaurant that served pizza. 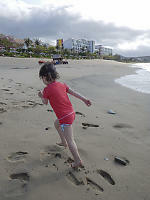 The kids were really happy to see a beach that was warm (if not sunny) where they could run around without shoes. We had a relaxing lunch and tried desperately not to fall asleep - the longer we stayed up, hopefully the later the kids would sleep in the next morning. We went back to our hotel and were probably asleep by 7pm. The kids were troopers, but there is only so much that a three year old can do. The tricky bit is the wake up the next morning - it's 3am and you have awake kids in a small hotel in Taipei. They are awake and they aren't going to bed. If you don't give them attention, they will get louder and louder until you get a noise complaint. You have a leave the building. Where do you got at 4am? Turns out Taipei has lots of breakfast options at 4 and 5 am. We wanted to try a breakfast place called 阜杭豆漿 but it turns out it's the 5am type and we were there at 4am. Just across the street is a place selling very similar items and it opens an hour earlier! You have to love Asia. We got breakfast and the kids watched video. The clientel seemed to be a lot of people that go to airports, mostly in sharp looking uniforms. Our kids time change about an hour a day. So the next morning at 5am we were in the lineup when 阜杭豆漿 opened. The signature dish is Shāobing (燒餅) which is kind of like a cross between Indian Naan (but sweeter and thicker, but still baked in a clay oven with crunchy bits) and a scrambled egg sandwich. It really is great breakfast food. The lineup forms fast - we arrived just after it opened and waited no more than 5 minutes to get our order in. We left around 6am and the line up was probably 45 minutes long. We ordered a bag of 10 Shāobing for Katie's family and dropped them off from our taxi ride back. When I heard "Botanical Gardens", I was thinking massive gardens and lawns. Taipei Botanical Gardens didn't really fit that model - yes they do have some forest/tree space, but much of the site is buildings and ponds. I quickly got over the semantics - within seconds of getting out of the taxi I spotted a photographer taking a picture of a very patient kingfisher. Part of our post flight strategy is to get sunlight. The Taipei Zoo seemed like a good idea to get some outside time. Katie made two recommendations - see the insect exhibit and don't try to see it all in one day. She was correct on both counts. The Zoo is very large and it turned out to be quite a hot day so we finished when the kids told us they were done. The insect show is similar to butterfly world - indoor glass house with lots of butterflies flying around. After a while, Claira decided she was scared of Butterflies (another way of saying bored). The kids really liked the Gibbons near the gate and the some of the Taiwan endemic exhibits were quite nice. We were underwhelmed by the kids area - we were expecting a petting zoo and it was more like a "see farm animals in small enclosures area". I'll be honest - a big component of our trip to Taipei was for Helen to go shopping. Taipei is a shopping destination - people in Taiwan come up for the day, but now there is also a stead stream of shoppers flying over from Mainland China to buy. Shopping with young children is a bit of an art form - you want to move enough that the kids don't get bored, but don't move so much that the kids get tired. You want to show the kids video when there are waiting times, but you don't want their whole day to be waiting. Downtown Taipei is a beautiful place, but I didn't have much luck taking photos and not losing my children at the same time. In Hong Kong, we quite enjoy Eslite (Hong Kong and Taiwan use traditional Chinese characters unlike mainland China) and Eslite has huge presence (multiple locations, some 24 hour) in Taipei. We went to a flagship location and I was quite surprised to see "Do It Yourself" stations all over the sales floor. We picked a station where you can make "Disney Inspired" dolls and the kids made a doll each. It took roughly 45 minutes of highly supervised time and it was surprisingly expensive, but the kids had a great time and a toy they kept close for the rest of our vacation. After a few days of Taipei, we took the high speed train down to meet Helen's friends in the south of Taiwan. The kids of been on high speed trains before (we took the Shinkansen back to Tokyo on our last trip) so I figured the kids just knew what was going on when we were zipping by the countryside so quickly. We often play the "how fast are we going" game when driving (50km/h, 80km/h) and biking (8km/h, 12km/h) so I was quite surprised when Nara though we were doing about 30 km/h in the train. I broke out Strava on my iPhone (love those roaming SIM cards) and Nara was really impressed when she found out we were doing 250 km/h (actually slowing down). We haven't taken the kids to a beach resort kind of destination yet. They haven't been to Hawaii or Mexico or an all inclusive in the Caribbean. Kenting was our opportunity to go to beach resort, Asia style. We booked three nights at Chateau Beach Resort which is beachfront in a "National Park" at the south end of Taiwan. The resort has what you would expect - beach front access, freshwater pool, plenty of palm trees and enough food options that you never have to leave. The "National Park" is just a shadow of National Park in Canada or the US (roads and communities everywhere). Of course the kids wanted to spend all of their time on the beach and in the pool. The beach is lovely sand and the water is pretty clear, but with a pretty constant surf (it was windy the whole time we were there) it was hard to relax when the kids could get washed in. 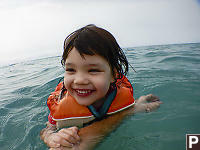 The resort had some beach toys for kids (shovels, buckets, sand molds) and also had life jackets that were mandatory for a swim in the ocean. They did have a life guard on duty and you were only allowed to swim in the roped in area. I tried to swim out to a rock to look for fish - I was quickly whistled at and they drove the ATV over. My bad. The grounds of the resort were nicely kept with a number of common bird species making their homes between the buildings and the beach. I was surprised how loud some of the birds were, but maybe it was just me sensitive to bird calls I hadn't head before. Kenting has a night market footsteps from our hotel that obviously caters to the daily tourist traffic. Most of the stalls are selling food and being off season, most aren't very busy. Compared to other resorts I've been to, it's nice to not be "locked in" to your resort - plenty of options a short walk away. We are spoiled with the Vancouver Aquarium. We have a membership so we go whenever we want and generally have short visits. The Vancouver aquarium is small but busy - you can get anywhere in less than 5 minutes, but you will almost never be alone. The Aquarium in Kenting is amazing - unbelievably large tanks full of mostly tropical things. The facility is built to handle crowds in the thousands and there seems to be just a few walking paths that encourage a "see everything once" trip. Being the off season, the place was almost empty and lonely. Angela's parents live in Tainan, as does Helen's friend Linda. After leaving Kenting, we had a dinner planned in Tainan and a few hours the next morning before we took the train back to Taipei and our flight to Hong Kong. Angela made a great choice with the Anping Tree House as our destination for the morning. This used to be a warehouse but a Banyan tree has been slowly overgrowing the house so that the house is now completely useless, but cool to see. They have done a ton of work to make this location tourist friendly. A huge steel structure was built so you can walk up to the roof and get a large view of the site. Particularly troublesome branches have been covered in foam so you don't bump your head too hard. While the building is in rough shape, I don't think it will fall on you (there are steel frames around some parts). There is a room discussing Banyan trees. It's quite interesting - apparently Banyan trees aren't very useful for wood (doesn't make good furniture, doesn't burn well) but because they don't have utility, they are left to grow large and become useful as shade and landmarks which becomes their own value. There are several species that grow in the Taiwan and each has their own properties. We were way off season, but it was sometimes hard to get a good view without other tourists. I didn't have making strong images from the place, but I'm sure with more time or talent there are some really clever images here. After picking up train snacks for lunch, we took the high speed train up to Taipei.